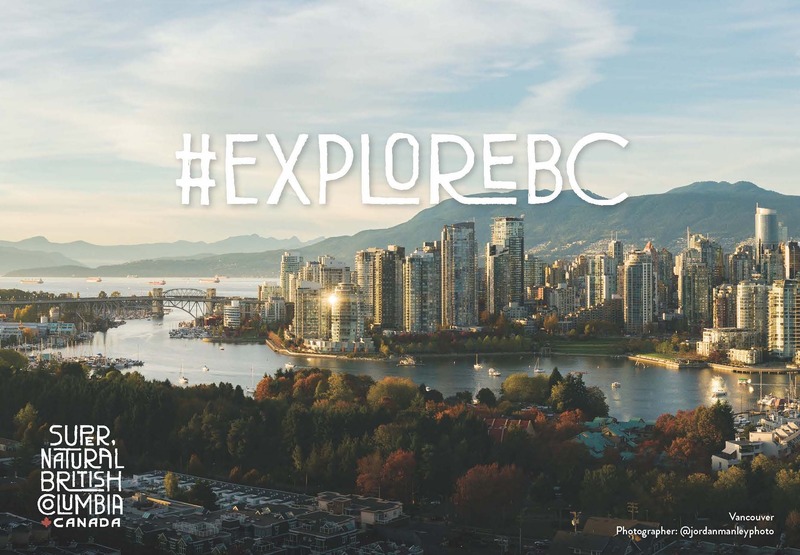 The Explore BC campaign encourages British Columbians to explore their own province, and share their BC travel experiences with the world through the #ExploreBC hashtag. The campaign is primarily aimed at motivating BC residents to travel within BC during the Spring, Fall and Winter shoulder seasons, and travel to areas with capacity in high season. The Explore BC campaign also proudly supports BC Wine Month in April. The campaign utilises a combination of traditional and digital media to reach British Columbians, with a greater emphasis on traditional media through a TV partnership. Partnerships are an important part of Explore BC as they provide DBC the ability to acquire new audiences and distribution channels to extend our reach and to elevate key messaging. FREE point-of-sale materials are also available to industry to display and distribute to BC residents and visitors. The point-of-sale kits help encourage the use of the #ExploreBC hashtag. There are four kit sizes: extra-small, small, medium, and large. The kits include postcards and a #ExploreBC window decal. Order your free kit.